Given price is for single Garland. 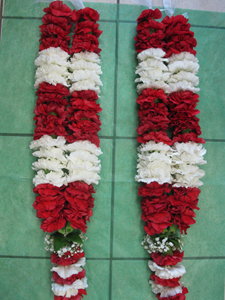 Jaimala - made with all carnations in red and white combination is used for hindu wedding ceremony. It can be further upgraded, please call OMNI FLOWERS for prices and service. Each Garland sold seprately. This is with medium strength. Colors can vary as per your choice. Only best quality fresh flowers used. Please book in advance.